If you are serious when you initially fire this app up it has about a 15 minute learning curve and one that will make allot of difference and ultimately sense. wikidPad is very handy when brainstorming and you are in a text entry frenzy where the ideas are spilling out faster than you can type. Mind mappers have their place, but this tool cuts out the crap of having to drop bubbles/shapes on a board and naming them as well as what ever else you need to do to establish the nodes identity. wikidPad is fast and light and all you have to do is read a page or two in the help documentation and you're up and running full speed. 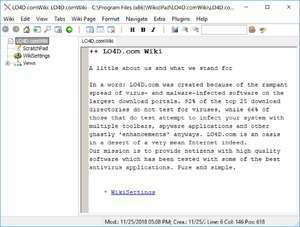 For security reasons, you should also check out the wikidPad download at LO4D.com which includes virus and malware tests. Additional screenshots of this application download may be available, too. wikidPad download been highly rated by our users.